They’re attached by our hair experts close to the root by tiny, invisible knots. 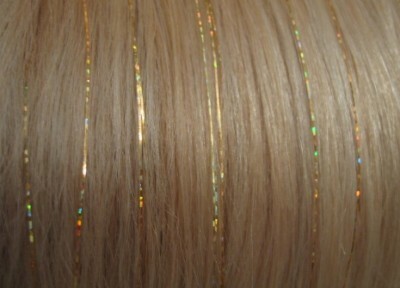 Depending on how well they are cared for, hair sparkle can last a week or more. Some clients have reported they had theirs for 3 weeks and beyond, however it varies for each client. Factors such as oily scalps, certain oily products, stress on the knot and strand (for example rough brushing) may cause the sparkle to come out prematurely. Hair sparkle can be flat ironed, curled, washed and styled just like normal hair. They will not damage your hair. (Provided that you can ever return to boring, sparkle free hair) hold the knot, gently pull along the hair until the strand falls out. Hair tinsel can be cared for like normal hair, however you should be careful when combing or brushing hair close to the roots to avoid catching the knots. How long it takes to apply depends on how many sparkles you would like. Subtle sparkle takes just a few minutes while a request for more sparkle can take 15 minutes to a half hour.